Parts of a Window: What is a Window Sash? 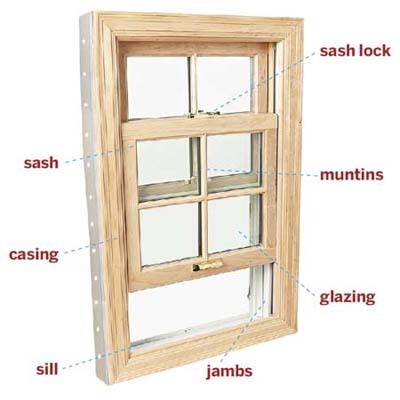 Parts of a Window: What is a Window Sash? What in the World is a Window Sash? Ready for today’s Windows 101 lesson? In this post we’re featuring one of the most important parts of a window, the window sash. A window sash is the part of a window that moves and holds the glass panes together. The sash fits inside the window frame, which is attached to the house. The sash will vary slightly depending on the type of window. For example, on a double hung window there is an upper and lower sash that move up and down. Having two sash makes the double hung window the easiest window style to operate and clean. Both sash also tilt in so that you can clean the outside of the window from inside your home. A slider window only has one sash and, unlike on a double hung, the sash on a slider window glides left to right. Casement windows also have only one sash. However, a casement window sash operates with a crank handle as opposed to sliding in the window frame. #FunFact: The plural of sash is still sash (not ‘sashes’). Learn more about different window styles and how they operate here. I would like to find where I could get replacement parts for my Simonton Windows mostly the rubber seal at the bottom of window all my windows seem to be dry rotted . Did you ever get a reply? I am really interested in the customer service. You can order parts through our customer service team. They can be reached at 1-800-SIMONTON Monday-Friday, or you can fill out a form at the link below and someone from our team will reach out to you. Let me know if you have any further questions! Everyone knows The Window Seat is always the best place to sit. So relax and enjoy the view. We’ve reserved this seat just for you. © 2019 Simonton Windows & Doors. All Rights Reserved. Like what you see? Subscribe to The Window Seat and we’ll send you articles just like this every week.